Yesterday, I mentioned on Facebook that one of my favorite features on my smartphone was on the map. I love typing the word “vegan” into the end location. 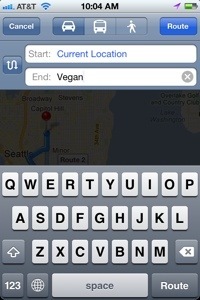 The map will then tell you the location of the closest vegan establishment. 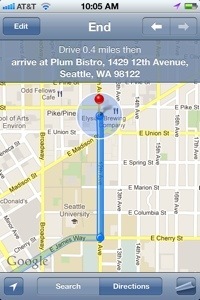 As you can see from the map below the closest to my house is Plum Bistro. It’s a fun feature when you are in an unfamiliar area. Yesterday the little vegan and I were 30 miles from home and were able to discover a new place to eat called the Mirkwood & Shire Cafe. Try it out! Warning, sometimes you’ll get grocery stores or coffee shops. I recommend looking up the location before going. To figure out the location name, simply go to the last page of the directions. Gallery | This entry was posted in Worthy of Sharing. Bookmark the permalink. wow, that’s a great tip! I love sharing things that are so simply that so many don’t know about!